Thursday night saw yet another huge Atlantic storm move in across Wales bringing with it gale force winds and more rain. Fortunately the latter didn't persist into the next day but those winds most certainly did. Following an aborted attempt to walk down Bishopston valley (footpath extinguished apparently) we found ourselves at Mumbles for the second time this week. Once again the Mediterranean Gulls were all present and correct but we were really interested in the sea which was raging under strong westerlies. All along the coast massive waves were breaking against the cliffs covering the coastal path in clouds of spray. 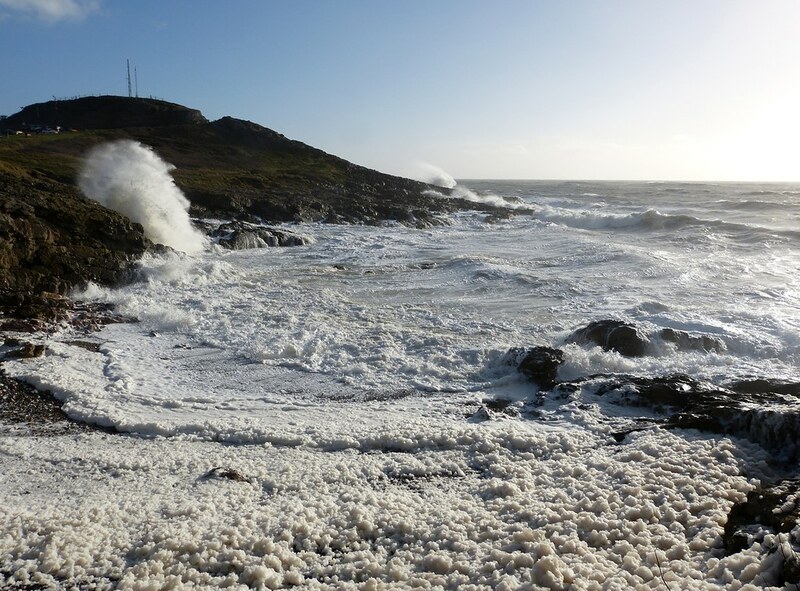 Walking its course towards Langland was certainly bracing and even allowed me to witness a geological spectacle hitherto confined to school textbooks. 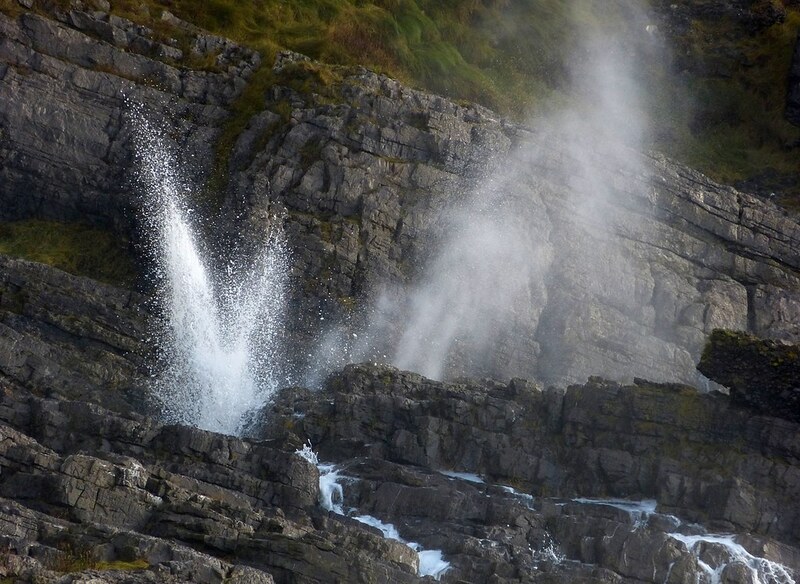 With water levels higher than normal two blowholes near Rams Tor were spouting plumes of spray high into the air and I did my best to capture events. 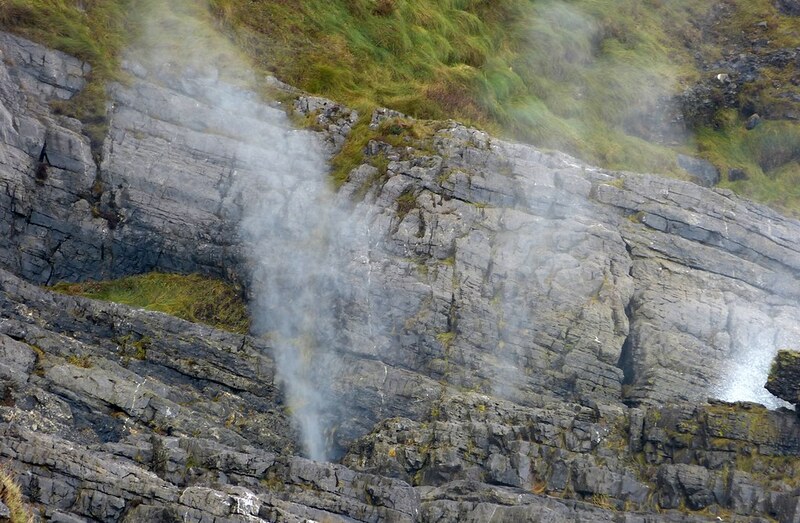 Blowholes are formed as sea caves extend landwards and upwards into vertical shafts which are eventually exposed to the surface. Our coastline is littered with them but the kind of display seen above is reliant on a suitable tide and a fair bit of luck. On this occasion we were fortunate enough to have both. 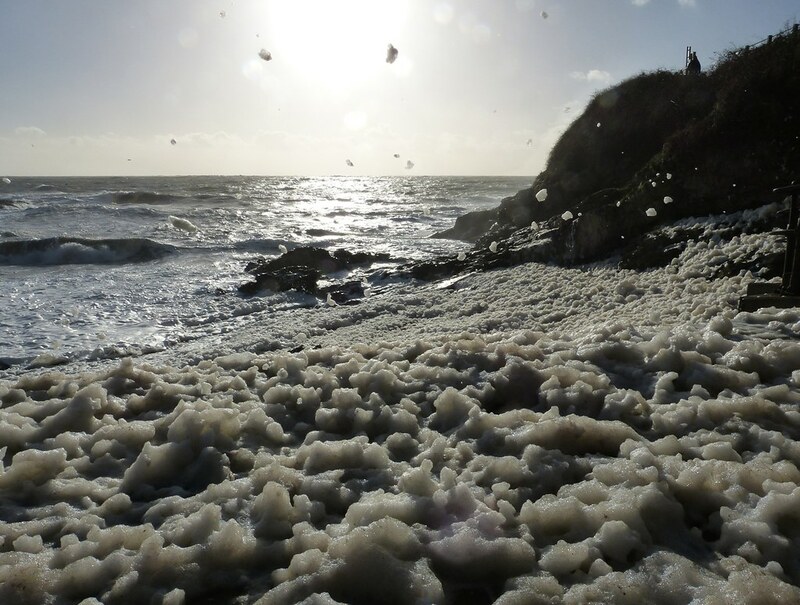 Just around the corner another phenomenon was unfolding where the agitated sea had generated a huge amount of spume, filling Limeslade Bay almost entirely. Each new gust of wind whipped a whirlwind of foam up into the air and onto the road beyond creating a surreal landscape. Obviously I had to get down there for a closer look. As you've seen the recent weather has certainly provided some interesting experiences, but please can we have a calmer time next week? Well I have just learnt something new here. I will be more alert when walking the coast in future. Some stunning imagery again Adam.